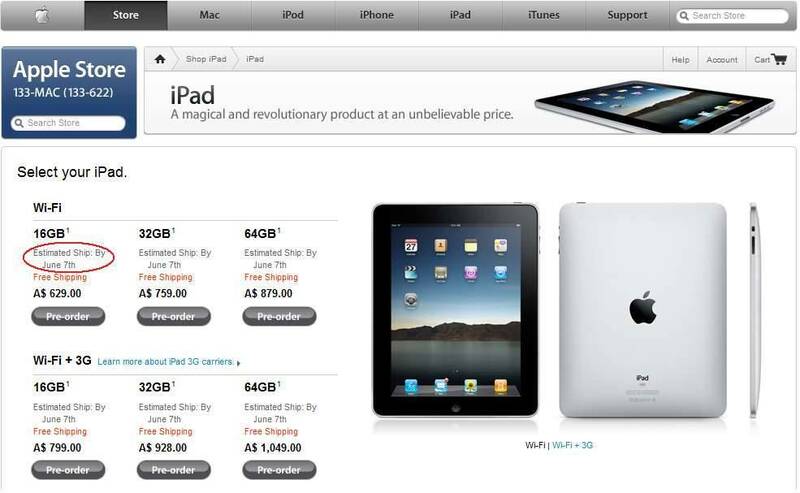 Demand for iPads overwhelms Apple's supply chain. Apple is rushing to order more iPads into Australia after it was caught flat-footed by a surge in demand since customers were able to order the device on Monday. Most of those hanging out for Apple's new tablet-style device will have to wait at least a week longer to snag one. Before it began taking orders through its website last Monday, Apple said the device would be available from May 28 but today pushed out the delivery date on its e-commerce website to after June 7. Apple's customer helpdesk confirmed that those who bought the device in the first two days it was available for order this week would still receive it before May 28, but those that have placed orders since yesterday have had their delivery dates pushed back to June 7. Apple sold more than a million iPads in the first month it was on sale in the United States.